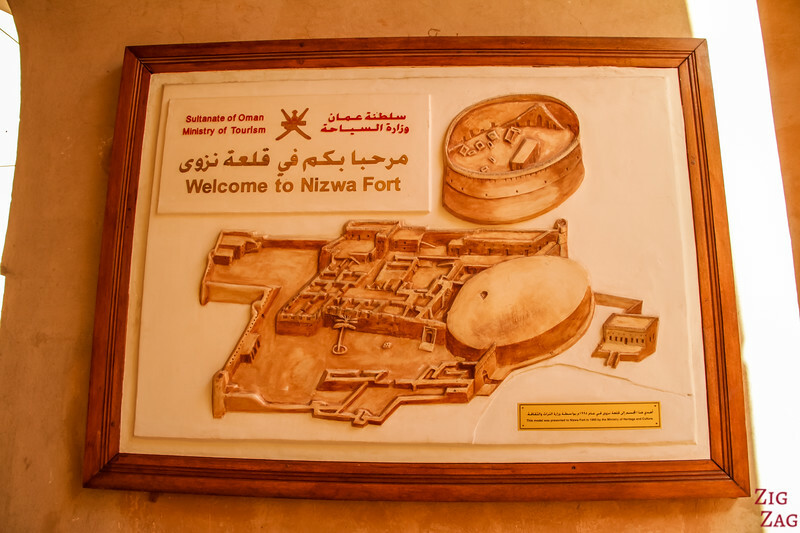 One of the most visited places in the Sultanate, the Nizwa Fort Oman is a combination of a castle, a fort and a museum. 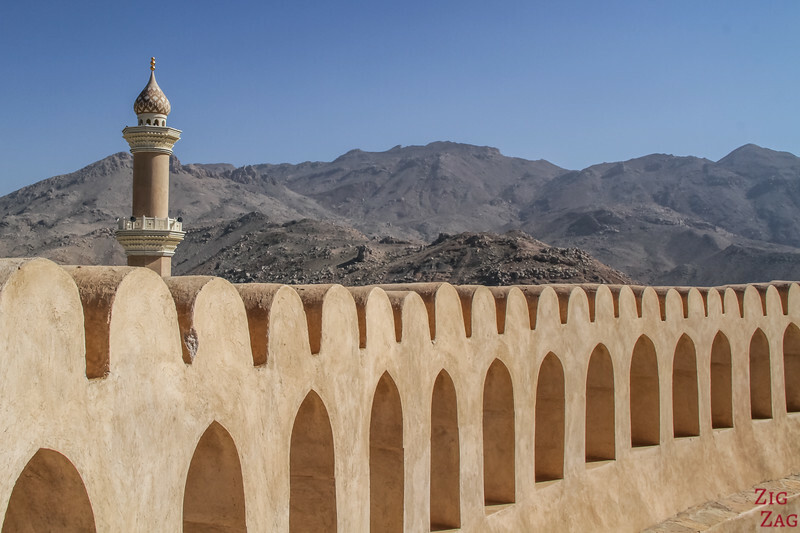 This great example of old Omani architecture is quite unique due to the circular shape of the tower which you can climb! 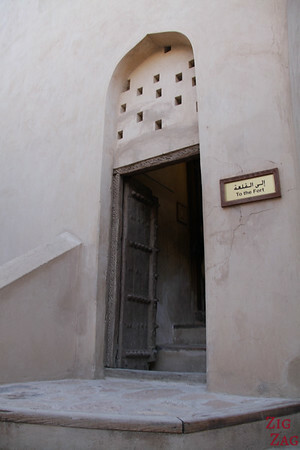 This is the entry of the Fort and Castle. 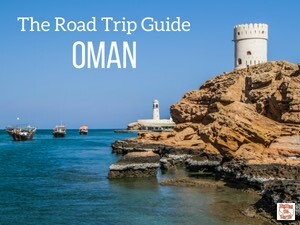 A place not to be missed on your Oman itinerary ! 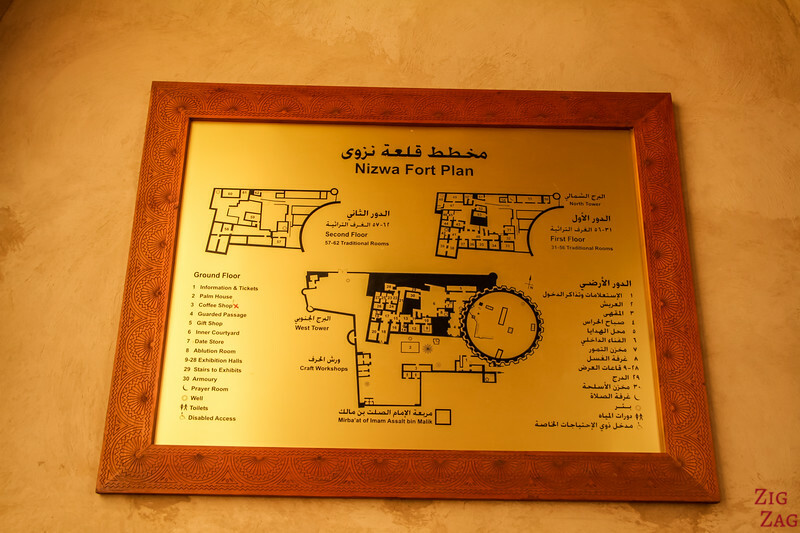 The Nizwa Fort is actually a combination of a castle and a fort (the Tower only). 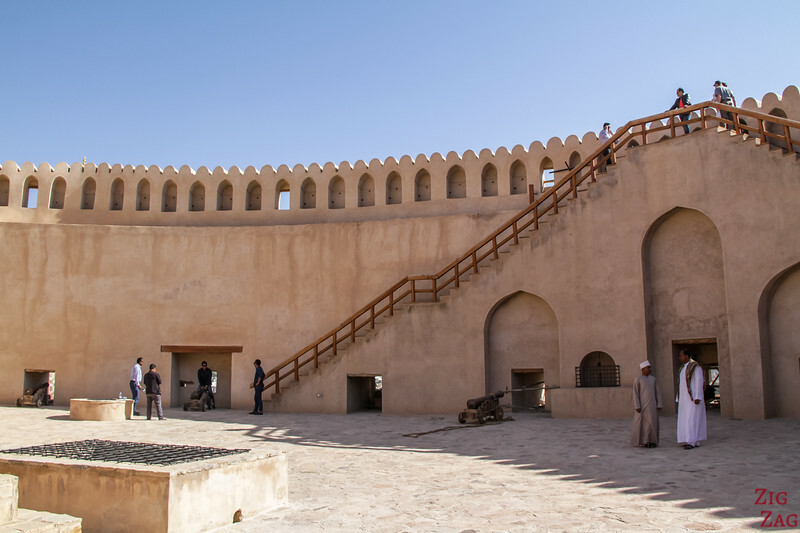 The Fort was built at the beginning of the 17th century​ byt the Imam Sultan bin Saif Al Yarubi. 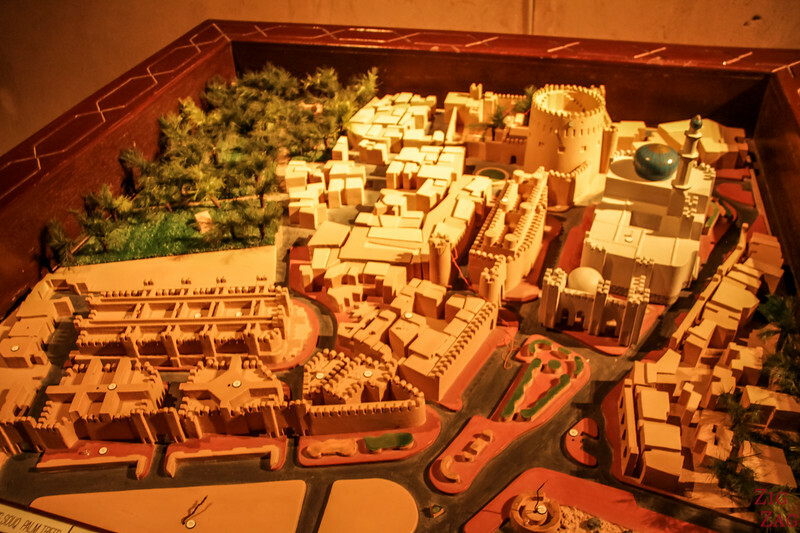 It took approximately 12 years to complete. 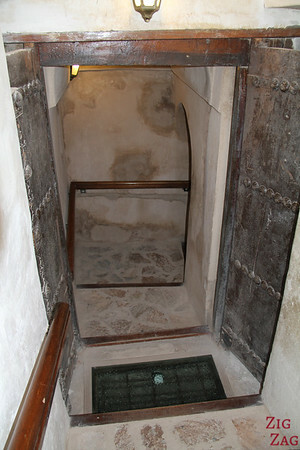 Originally built in the 9th century and renewed in 1624. 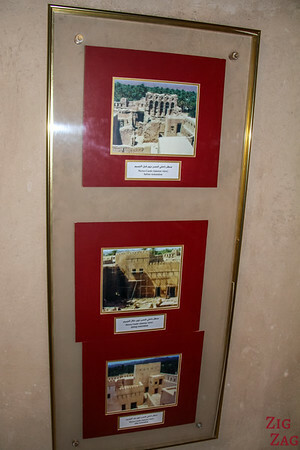 One room also has photos of the restoration. 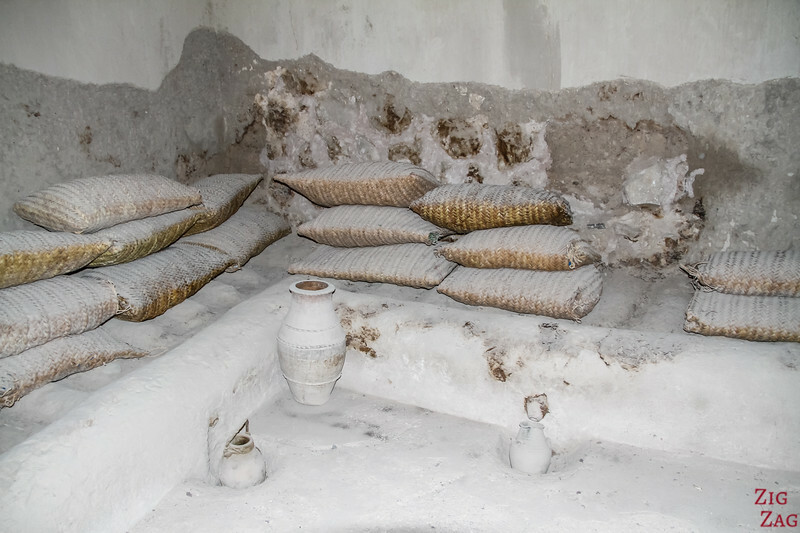 Both the Castle and the Fort have been restored using traditional methods and materials. 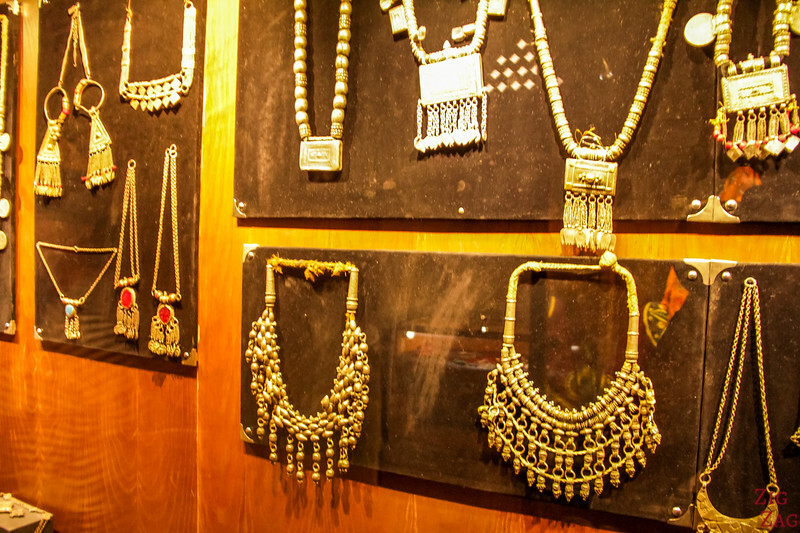 It was quite interesting to see the before and after. 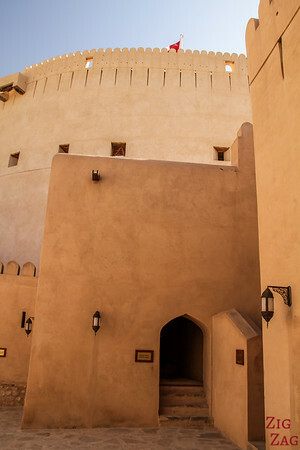 I really enjoyed walking around the castle and climbing on walls. 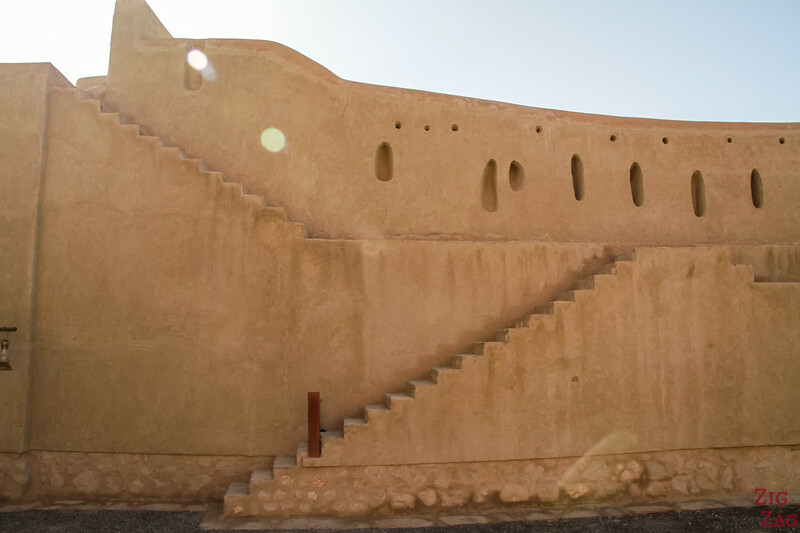 The lines and level are all different and creating interesting geometrical visuals. 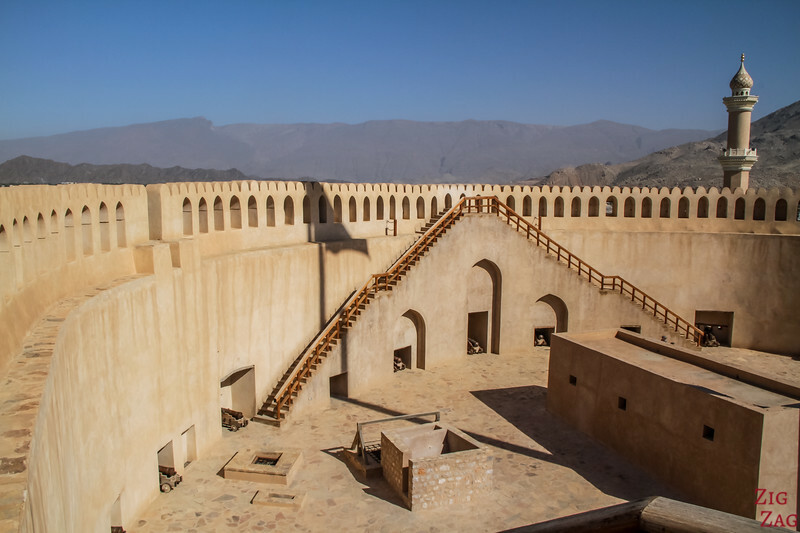 This is parly why it made it on my list of top 10 things to do in Oman. 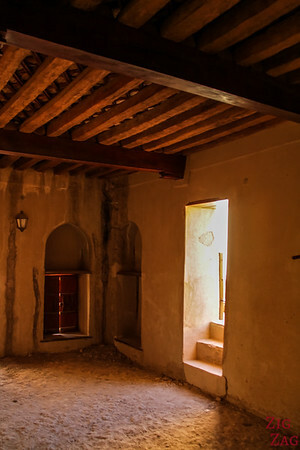 Don't miss climbing on those walks (being careful) to see the ruins of old houses left around the fort. 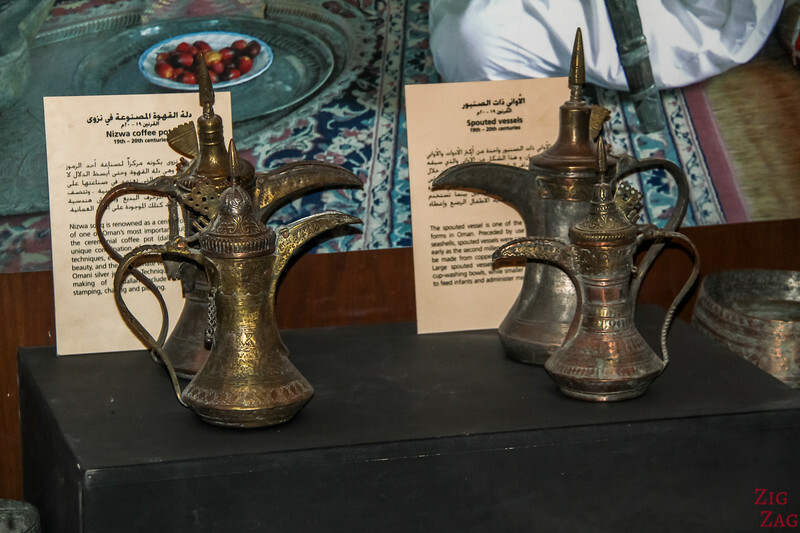 Inside the castle are many exhibits to present the traditional way of living in Oman. 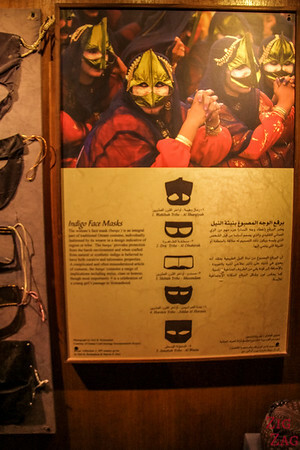 The displays were nice and written in Arabic and English. 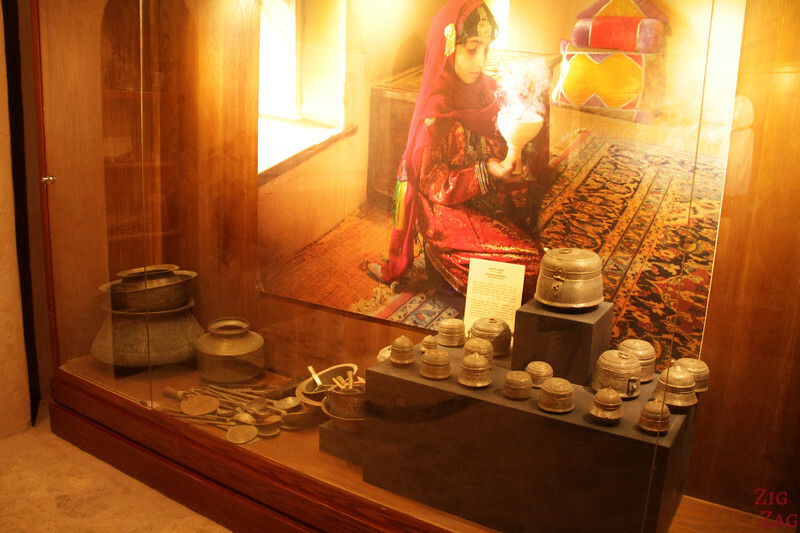 It is a simple museum and I liked it because it does not overwhelm you with information. 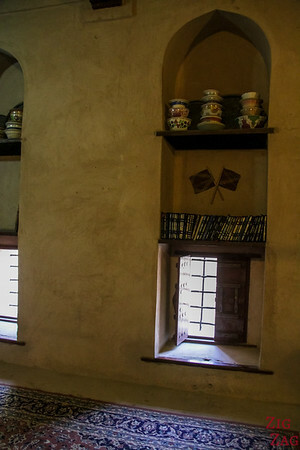 Next to the tower you can enter and see some decorated and non decorated rooms. 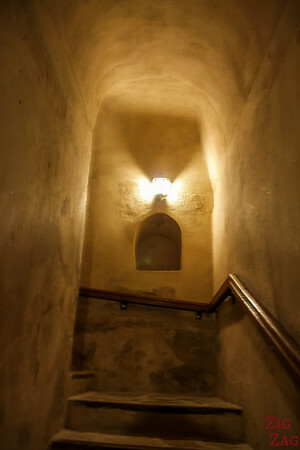 You can also climb stairs to a terrace level where you get another view of thse geometrical superpositions. 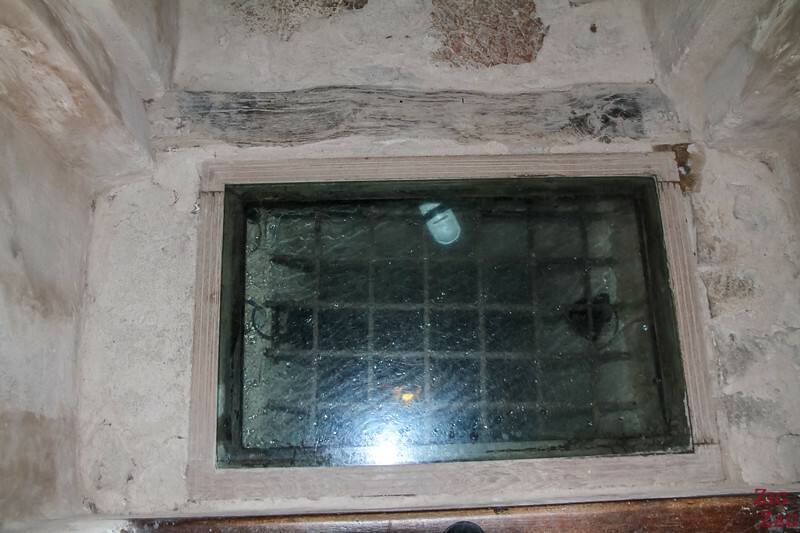 It’s worth climbing to the platform of the tower and then to each of the viewpoints. 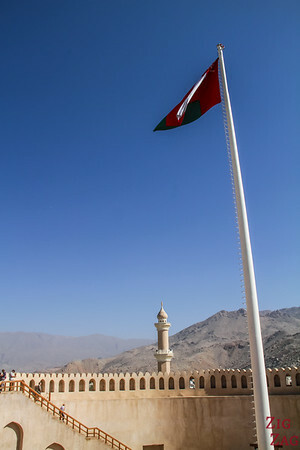 From there you can see the oasis and th Hajar Mountains. 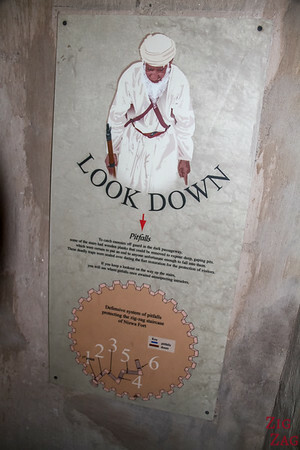 Don't forget to look at the thick door and traps to stop attacks on the fort. 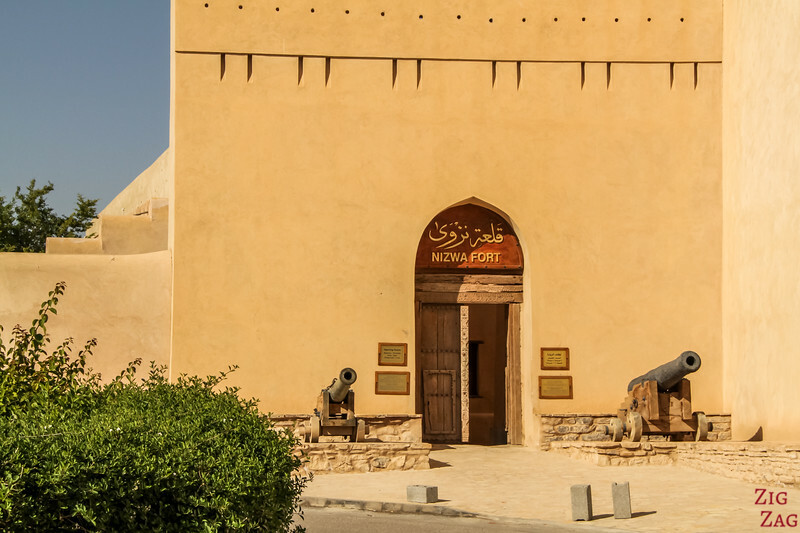 And if you want to know more about the fort's protection system, check out the post by Man on the Lam with a drwaing of how murder holes worked. When you reach the platform you see 3 set of stairs at one third of the perimeter. 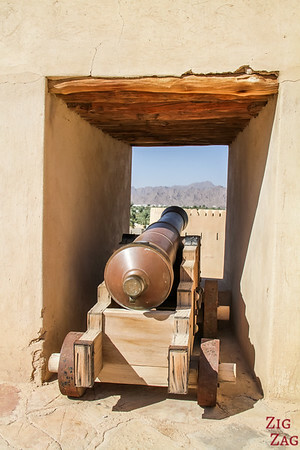 You can also admire canons if you are into firearms. I prefered the views. 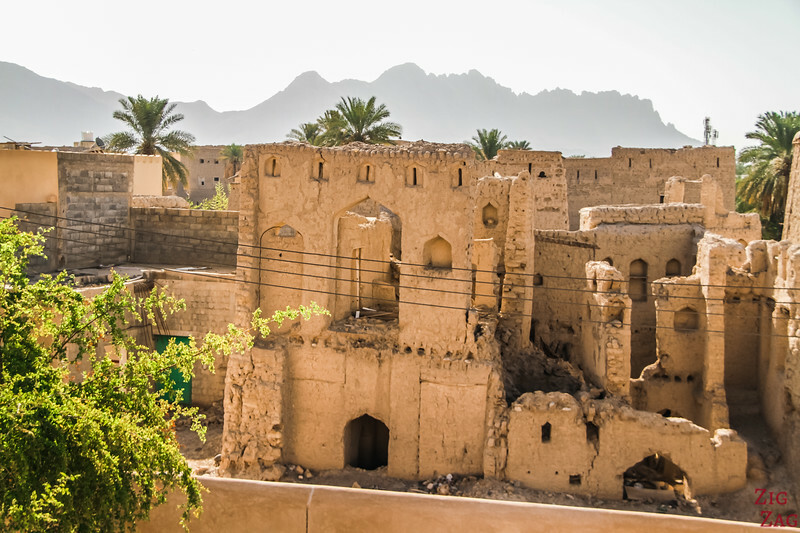 This view is the other reason why the Nizwa Fort made it on my list of top 10 things to do in Oman. 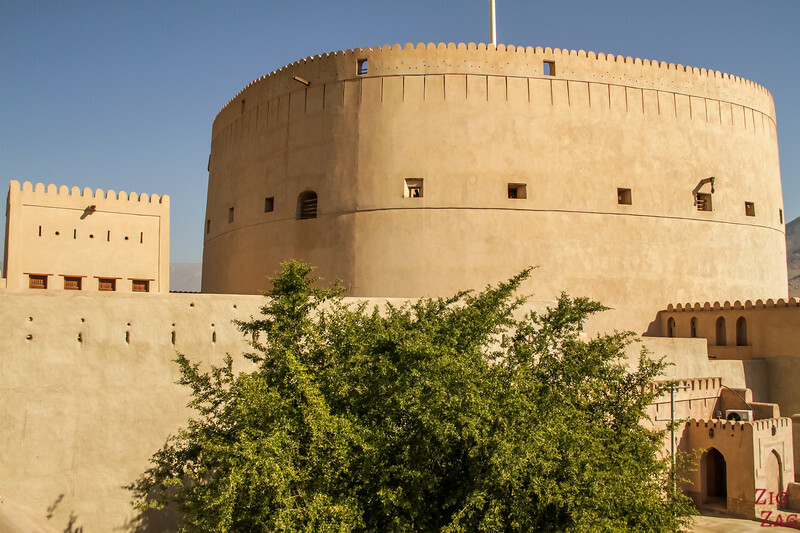 The Nizwa Fort, along with many other beautiful places, is included in my eBook: Experience Oman. 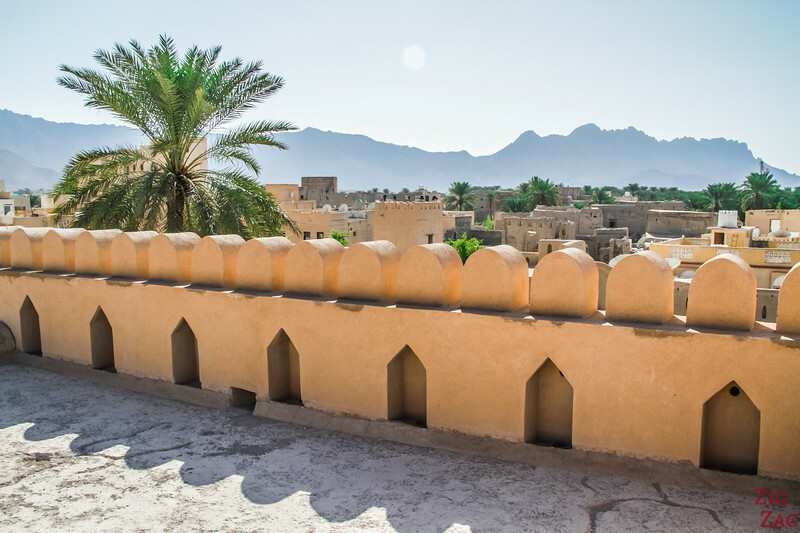 A great mixture of museum, architecture and views, don't you think?